This is a place for purists, for gastronomes, for happy gluttons who just want a big plate of real Mexican food. It is also absolute heaven for the tequilaphile. 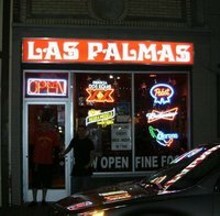 Las Palmas stocks more than 50 tequilas, including Patron, Del Dueño and an excellent tequila liqueur called Agavero. The tequilas are warming and delicious alone, and super-good in margaritas. But you really oughtn't drink your dinner, if only because Las Palmas cooks up some of the best-tasting Mexican food in town. If there's a standout among the entrées, it's the pollo enchiladas verdes: The chicken is velvety-tender, the tortillas freshly made, the Chihuahua cheese tangy, the green sauce a perfect blend of tomatillo, cilantro and onion. Welcome to paradise. See listings for additional locations below and under "St. Charles County."